I love meat. Meaty, meat, meat. Here it goes down, down into my belly. Get the gist? This girl loves a good steak, a buttery roasted chicken, a juicy piece of pork...and BACON! I often turn my nose at vegetable only dishes. Don't get me wrong, I love a side of roasted brussel sprouts or mashed sweet potatoes, but they just don't cut it as the star of my dinner plate. When I found this (vegetarian, shhh) Caramelized Mushrooms and Dumplings recipe, a play on traditional chicken and dumplings, I knew I had to try it. 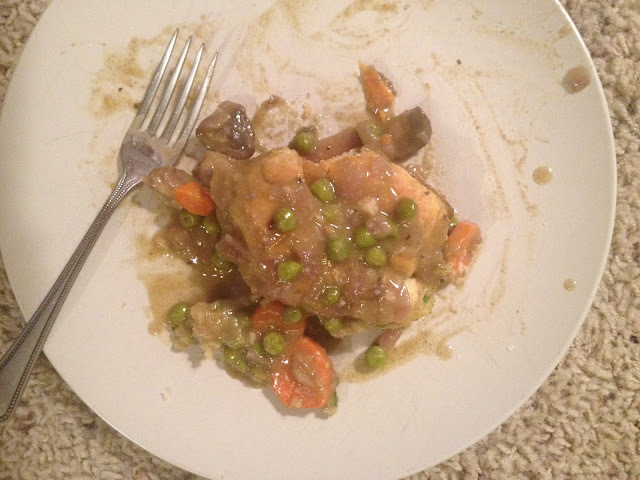 Mushrooms play the protein in this dinner play, and because the boyfriend, who hates mushrooms, was out of town, I knew this could be my one and only chance to make it. So I carpe'd the mushroom diem. Use a large pan! I learned this the hard way. Over-spillage everywhere. Looks so appetizing. 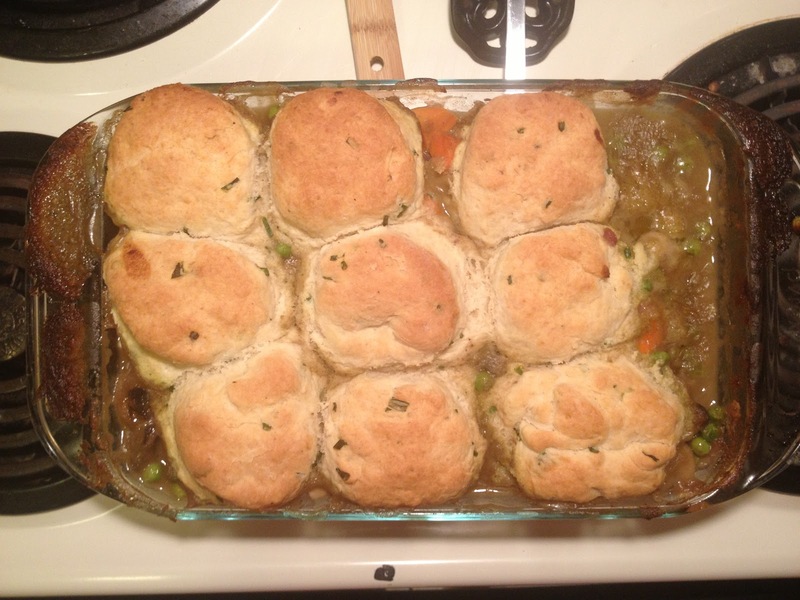 Caramelized mushroom and buttery biscuit slop. Oink. The dish was super yummy and easy to make. Including food prep, the whole cooking experience took about an hour-and-a-half (the longest part of process was chopping all the veggies). The dumplings were actually buttermilk, chive biscuits and they were delicious! I highly recommend this dish. Even if your'e not a fan of mushrooms, you'll like it. I know. I'm never wrong. In a bowl, whisk together flour, baking powder, baking soda, salt, sugar, pepper and chopped chives. Add cubed butter to the dry ingredients. Use your hands to mix together until the butter is about the size of small pebbles. Make a small well in the center of the butter/flour mixture (like you do mashed potatoes when adding gravy). Add the buttermilk mixture. Using a fork, combine the wet and dry ingredients. Try to moisten all the flour bits with the liquid. Dump the biscuit dough onto a floured surface and knead until it forms a disk about 1 1/2-inch thick. Use a 1 1/2-inch biscuit cutter (I don't have a biscuit cutter, so I used an empty soup can) to cut biscuits. Makes about 9 biscuits. 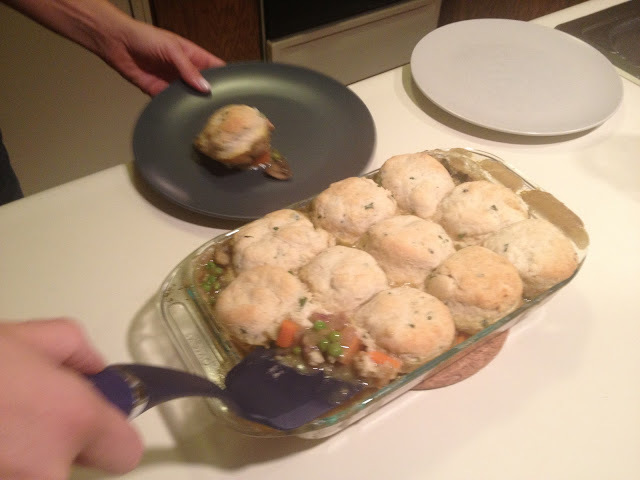 Place biscuits on a cookie sheet and place in the fridge until ready to put on top of mushroom mixture and bake. In a LARGE saucepan, over medium heat, melt butter into olive oil. Add cremini mushrooms (my grocery store didn't have cremini, so I used white mushrooms) and allow to cook, without disturbing, for about 4 minutes. Add pinch of salt and pepper. Toss mushrooms until soft and golden brown. Remove mushrooms from the pan. On medium heat, add a touch more olive oil to the pan and sauté onions until translucent. Add garlic and toss for 1 minute. 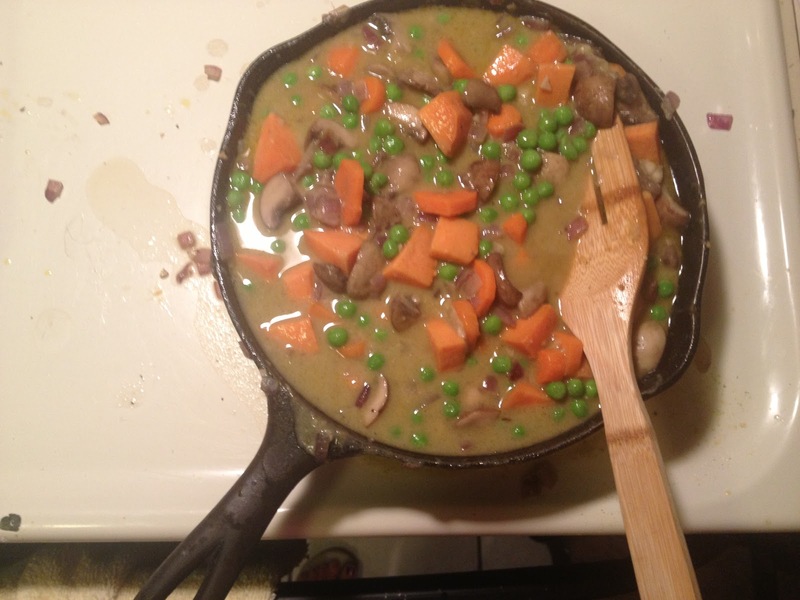 Add carrots and sweet potatoes and sauté for 5 to 7 minutes (potatoes should become only slightly soft). Add thyme. Return mushrooms to the pan. Turn heat to low and add flour. Toss together. Slowly add broth, stirring constantly until thickened. Add peas. Pour mushroom mixture into an 8x8-pan (I used a 9x13). Remove biscuits from the fridge and place them over the filling in the pan. Bake for 20-23 minutes (it took me about 35 minutes), until biscuits are golden brown and cooked through. Allow to cool. Enjoy! I don't like mushrooms but maybe I could substitute something else!